– Says Ashafa contributed immensely towards success of Lekki Deep Sea Port project. The Vice President, Professor Yemi Osinbajo SAN, on Thursday 29th March, 2018 commended the Senator representing Lagos East Senatorial District, Senator Gbenga B. Ashafa for his consistency in attracting developmental initiatives to the district. This the Vice President noted has been the manner of approach of the Distinguished Senator even since his days as the Executive Secretary of the Lands Bureau of Lagos State. 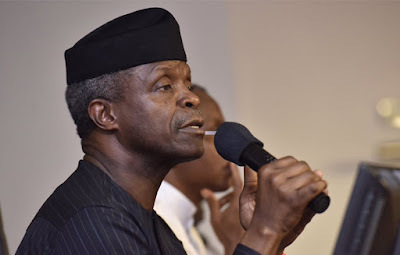 The Vice President in his speech also stated that the project, when completed is expected to create up to 170,000 direct and indirect jobs in the economy. “It is a landmark project for several reasons — the promoters of this project are targeting, we are told, about 1.5 million TEUs (Twenty Equivalent Units) container capacity annually, which they expect to grow to about 2.7 million and 4.7 million TEUs when the project commences. ”With this feat, this sea port will become one of the largest in our region and serve as a hub for ports operations in the whole of West Africa. ”There is no question at all that the project will be the largest in Sub-Saharan Africa and possibly, the largest in Africa. On his part, Senator Ashafa commended the Muhamadu Buhari Government for its dedication to ensuring that every nook and cranney of Nigeria enjoys infrastructural projects. He also thanked the Federal Government and the Lagos State Government led by Governor Akinwunmi Ambode on behalf of the people of Ibeju Lekki and Lagos East for making the project a reality.